HALIFAX, NS / ACCESSWIRE / March 12, 2019 / Namibia Critical Metals Inc. ("Namibia Critical Metals" or the "Company" or "NMI") (TSXV:NMI) today provided an update on a number of project activities from their diversified critical metals portfolio. The Company has received further drill results from its Kunene cobalt-copper project and has initiated gold exploration programs at the Otjiwarongo and Grootfontein projects. An airborne electromagnetic survey has been contracted to SkyTEM Surveys ApS ("SkyTEM") and is planned to be flown over the Grootfontein mafic complex in April to assist in the detection of magmatic nickel-copper sulphide mineralization as well as to explore for Mississippi Valley type lead-zinc-vanadium deposits similar to the neighboring Berg Aukas Mine. The Company has also received preliminary comments on results of metallurgical test work on mineralized samples from the Area 4 heavy rare earth deposit at Lofdal and from the Epembe tantalum-niobium project using XRT and XRF ore sorting technologies. Don Burton, President stated, "Exploration on the Kunene Co-Cu project has yielded encouraging drill results for follow-up and a number of key targets remain to be tested. However, given the ongoing low price of cobalt, management sees this is an opportune time to re-focus exploration on other related commodities of interest such as gold, nickel, copper, zinc and vanadium in our diversified critical metals portfolio. We will therefore allocate more of our available resources to the Grootfontein and Otjiwarongo projects." gold deposits of the Otjikoto type where B2Gold has an operating 2.75 million ounce gold mine1. The entire area is poorly explored due to the extensive cover of Kalahari sands and calcrete. The first two deposit types are ideal electromagnetic ("EM") targets and the Company is planning to fly the first airborne EM survey over the mafic complex at flight line spacing of 400 meters and over the Berg Aukas target area at a flight line spacing of 200 meters (Figure 1). Based on historic drill holes and airborne magnetic survey interpretations, Grootfontein constitutes a huge mafic complex covering 360 km2 with the potential to host magmatic nickel, copper, vanadium, platinum group elements and chromite mineralisation as cumulates or late magmatic disseminations and stockworks. Two shallow drill fences (total of 1,386 m) were drilled by Anglo American in 1988 and more recent work by Ongopolo Mining proved that the main intrusive phases are depleted in nickel and copper. The Company's exploration model therefore assumes that metals were likely fractionated as sulphides during the intrusive phase, gravitationally accumulated in the magma and intruded in the adjacent, pre-existing rocks. Immediately north of the mafic complex there is potential for Mississippi Valley Type lead-zinc-vanadium mineralisation as evidenced by the Berg Aukas mine. Berg Aukas is a dolostone-hosted deposit which according to historical records, produced 1.6 Mt of ore grading 4.0% Pb, 16.8% Zn and 0.9% V2O5 during the period 1967-1975. The Grootfontein project area hosts favourable stratigraphy for this deposit type immediately west of Berg Aukas. The Damaran Gold Belt which hosts the Otjikoto gold deposit (2.75 million ounces gold, B2Gold) stretches over the southern half of the Grootfontein license block. The orogenic gold mineralization is typically associated with hydrothermal alteration and pyrrhotite mineralization which form magnetic anomalies. The Company has purchased and interpreted 200 meter line spacing magnetic survey data from the Geological Survey of Namibia. The magnetic anomalies are interpreted to occur within the same stratigraphic and structural setting which hosts the Otjikoto Gold Mine. This area is also completely covered and will be explored using soil geochemical survey methods. Otjiwarongo is another early stage conceptual target based on geophysical data. Circular anomalies will be tested for potential mineralizations associated with alkaline intrusive complexes such as niobium-tantalum, fluorspar and rare earths. Typical examples for these mineralizations are the Okorusu fluorspar deposit and the rare earths mineralization at the Eisenberg complex. The circular anomaly measures one kilometer in diameter and can be easily tested by drilling to determine if in fact a carbonatite body is the source and what styles of mineralization might be associated with it (fluorspar, rare earths, tantalum, niobium etc.). 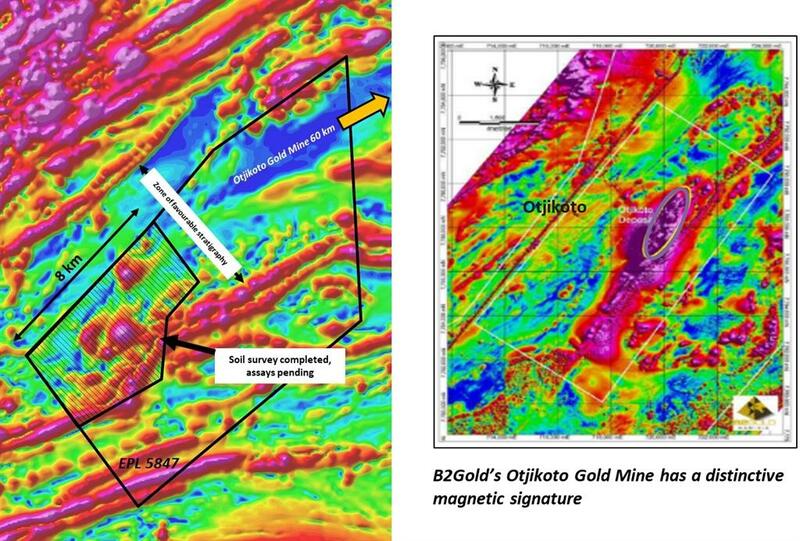 The magnetic anomalies of interest at Otjiwarongo are also situated in favourable stratigraphy and structural setting of the Damaran Gold Belt and may be associated with gold mineralization similar to that at B2Gold's Otjikoto gold mine (Figure 2). As at Grootfontein, the area of interest is largely hidden by cover. The Company has already collected 925 soil samples on a 200 x 100 meter grid over the key magnetic anomalies in the western portion of the project area. Samples have been submitted to Activation Laboratories for multi-element ICP and for gold fire assay analyses and results are pending. 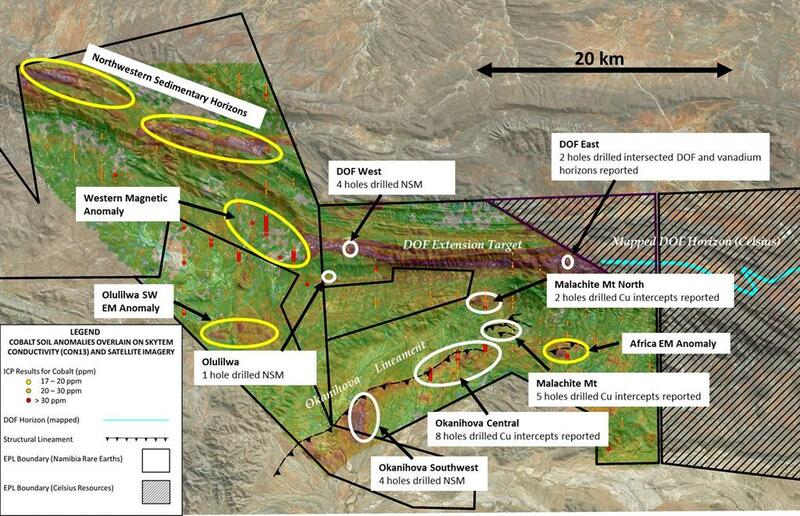 As was previously announced (Company press release dated December 18, 2018) drilling at Kunene indicates the continuation of the Dolomite Ore Formation ("DOF") which hosts the Opuwo Co-Cu-Zn deposit which is under development by Celsius Resources Ltd., on to Namibia Critical Metals' land holdings. 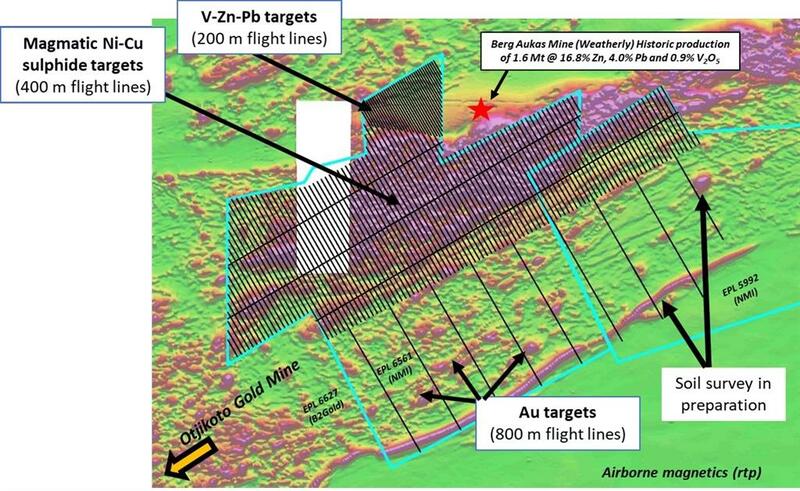 In addition to the Co-Cu horizons, two vanadium-enriched horizons were intersected within the same stratigraphic sequence in the NMI drill holes. Results from the first three reverse circulation holes on the Okanihova Central Target were also previously reported and indicates widespread copper mineralization in the sedimentary strata in the hanging wall of the Okanihova lineament. 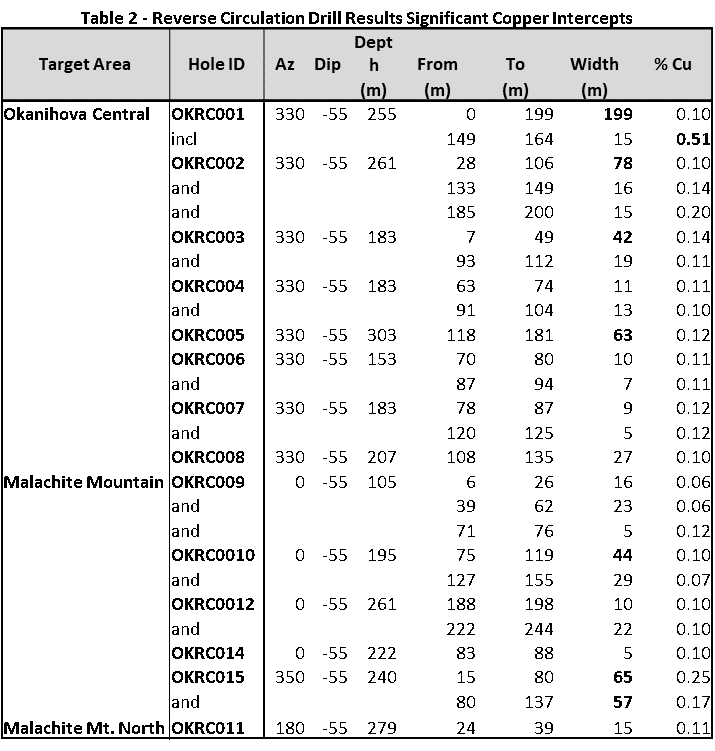 Additional results have been received from five other target areas (Figure 3) and all drill results are now reported (Table 1 and Table 2). All drill hole analyses were carried out under strict QAQC protocols including the insertion of standards, blanks and duplicates. Sample preparation was carried out by Activation Laboratories (Windhoek, Namibia) and ICP analyses with appropriate acid digestions were carried out by Activation Laboratories (Ancaster, Canada). The Phase 1 drilling program has tested seven target areas with a total of 1,481 meters of diamond drilling in 8 holes, and 4,283 meters of reverse circulation drilling with 19 holes. Significant results requiring additional drilling were realized at DOF East (DOF Extension target), at Okanihova Central, at Malachite Mountain and at Malachite Mountain North. No significant mineralization was intersected at Okanihova Southwest, Olulilwa or at DOF West (DOF Extension target). widespread copper mineralization at Malachite Mountain (Table 2). The DOF and vanadium horizons require further testing along strike and down dip. The results from drilling along the Okanihova lineament and at Malachite Mountain require further evaluation in order to identify higher grade structures within the widespread low grade mineralization encountered to date. The two most advanced projects in the Company's portfolio are the Lofdal Heavy Rare Earth Project and the Epembe Tantalum-Niobium Project. At Lofdal, a preliminary economic assessment ("PEA") was completed in 2014 and following completion of an environmental impact assessment ("EIA") in 2016 the project was provided with Environmental Clearance Certificates from the Ministry of Environment and Tourism in 2017. Mineralization at the deposit is dominated by xenotime which is highly enriched in heavy rare earths (most notably terbium, dysprosium and yttrium). An application has been made for a mining licence which remains pending. Epembe hosts a well defined mineralized carbonatite dyke with over 11,000 m of drilling and preliminary metallurgical studies completed to investigate processing options for the mineral pyrochlore which hosts the tantalum-niobium-uranium-phosphate mineralization. The Company has allocated a modest budget to focus on maximizing efficiencies of ore sorting technologies to which both the xenotime and pyrochlore mineralizations are amenable. Upfront sorting can provide significant benefits to operating and capital costs by eliminating internal waste from run-of-mine feed ("ROM") thereby minimizing volumes to milling and downstream chemical processing. The Lofdal PEA incorporated x-ray transmission ("XRT") sorting into the beneficiation flowsheet and made recommendations that x-ray fluorescence ("XRF") sorting be investigated as a further means of upgrading the ROM. Preliminary investigations into the amenability of Epembe tantalum-niobium to XRT and XRF were also positive. In order to efficiently evaluate the sorting technologies, bulk samples were taken from both deposits and first stage testing of selected particles at various size and grade ranges has been completed (Figure 4). This data is needed to develop the sorting algorithms that will be used in the bulk sample tests. The bulk samples (18 tonnes from Lofdal and 25 tonnes from Epembe) have been delivered to the Light Deep Earth test facility in South Africa and sorter tests will be conducted by Mentanza Metallurgical Laboratories using a Rados XRF sorter and by IMS Engineering using a Steinert XRT sorter. Results from the Rados XRF particle tests have concluded that both deposits are amenable to full scale sorting and have recommended that algorithms be developed for Lofdal using yttrium, iron, calcium and thorium, and for Epembe using niobium and iron. Previous test work with Tomra Sorting Solutions in Germany confirmed the amenability of both Lofdal and Epembe to upgrading with XRT sorting and the current test work with IMS will compare efficiencies with Steinert XRT machines. The bulk samples will be coarse crushed and screened to appropriate size limits for the respective machines by Light Deep Earth, pending delivery to Mentanza and IMS for bulk sample testing.